8 privatly owned Houses next to KanTiang Beach, Koh Lanta, Southern Thailand. For Rent . 8 privateide Hus ved KanTiang Beach på Koh Lanta i det sørlige Thailand. Til leie og . PARADIS ;) Koh Lanta, ko, koo, Lanta, KohLanta, Island, thai, Thailand, House, Houses, for, , til, , for, , hus, bungalow, bungalows, pool, garden, basseng, hage, Own, my, , Baan, Kan, Tiang, Tieng, beach, strand, bay, best, beste, utleie, rental, for, rent, til, leie, Koh, ko, koo, Lanta, KohLanta, Island,krabi, south, sør, Thailand, House, Houses, for, , til, , for, , hus, bungalow, bungalows, pool, garden, basseng, hage, Own, my, , utleie, rental, for, rent, leie, Koh, ko, koo, Lanta, KohLanta, Island, krabi, south, sør, Thailand, thai, Thai, House, Houses, for, til, , for, , hus, bungalow, bungalows, pool, garden, basseng, hage, Own, my, , next to Oriental ResidenSea, next to Pimalai Resort & Spa, next to Baan Laanta, next to Phra-nang Lanta other accomodation, lodging, new Estate, villa,Twice as big plot, with not to big houses will give room for more NATURE and GARDEN. As many houses as possible on a smallest possible plot, is certainly the philosophy for most real estate sellers in Thailand at the moment, and started the initiative for this project. More space is luxury now, but will be even more luxurious later, when most live very close. Its not many chances you get, to have a piece of paradise, so why build as you live in the middle of a city? Dobbelt så stor tomt og mindre men innholdsrikt hus, gir mer plass til NATUR og HAGE. Flest mulig og størst mulig hus på minst mulig tomt, som er gjennomgangstemaet om du skal kjøpe noe i Thailand for tiden, ble helt feil for initiativtakerne til dette prosjektet. Mer plass er kanskje luksus nå , men det blir en anda større luksus senere, når de fleste bor tett i tett. Ikke så mange muligheter igjen til å få en bit av et paradis, så hvorfor bygge som om en bor midt i byen? Det skal bli 8 hus på noe over 160 kvm, med opp til 8 sengeplasser, 3 bad og mye terrasse Innkvartering til ansatte Resepsjon og kontor Svømmebasseng med et Grill og "Bar" område Aktivitetsområder til plenspill, sandvolleyball samt "putting/chipping green" Hageanlegg med noen dammer Parkering There will be 8 houses just over 160 sqm, with up to 8 beds, 3 bathrooms and plenty of terrace area Staff area and lodging Reception and office Swimmingpool with a Grill and "Bar" area Activity areas for lawn games, volleyball and a "putting/chipping green" Garden with a few ponds Parking The Perfect Moment in Time Koh Lanta is living that window of time where the rhythm of life is slow even if one eye is on the island`s soon-to-grow popularity. Found in Sawadee, Thai Airways’ Magazine, of February 2007. Article is written by Michael Spencer and photography is by Christopher Wise. (If any of the above object to this article being accessible here, contact adminbaan@thunes.ws and it will be removed.) IT'S THE ETERNAL DILEMMA OF THE TRAVEL WRITER: What to do, when you visit a place you enjoy so much that you want to keep it a secret? Do you play down its merits in the hope that fewer people will go there, or do you tell the truth and risk it being overrun? I faced just such a choice after a recent visit to Koh Lanta, a big, beautiful island in Southern Thailand that seems to have it all: gorgeous, mostly empty beaches, a mountainous interior covered with abundant tropical forest and a small but good selection of hotels and restaurants with a sprinkling of funky bars and cafes. Koh Lanta is hardly unknown; it has even been billed as the next big thing on the Andaman coast after Phuket. But so have Phangnga, Krabi and Koh Phi Phi, and until now the island has slumbered in blissful obscurity, just below the horizon of mass tourism and the big tour operators. Given its natural charms, this situation will not last forever, but for the moment Koh Lanta is a delightful, laid-back destination where the roads and the beaches are generally empty and the rhythm of island life is wonderfully slow and relaxed. There is no shortage of lovely islands in Thailand, but what sets Koh Lanta apart from better known ones like Koh Samui, Koh Chang and Phuket is that right now Koh Lanta is at that perfect moment in time when it is just developed enough to enjoy in comfort but not yet at the point that it has begun to lose its idyllic charm. A holiday on a deserted island may sound like a great idea in theory but in practice you really do want to have a few other people around to enjoy it with, not to mention the opportunity to have some creature comforts like a relaxing massage and a choice of dining options. Koh Lanta can satisfy those who just want a simple bungalow near the beach and others who crave the luxury of a five-star boutique resort with all the extras. As a result, Koh Lanta tends to attract a more discerning type of visitor, more independent and apparently capable of enjoying themselves with simpler and natural pleasures than just shopping and partying. As yet there is no Patong-style entertainment zone, and nothing even remotely resembling a shopping mall anywhere on the island. 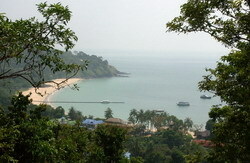 Koh Lanta's low profile could also be due to the fact that the island is still a little off the beaten track. There is no airport on Koh Lanta itself and most people arrive via the more popular Phuket or Krabi by speedboat or ferry. A newly inaugurated hydrofoil service from Phuket to Koh Lanta via Koh Phi Phi has now cut the travelling time to less than two hours of very smooth and comfortable sailing. ALTHOUGH IT WAS THE START OF THE CHRISTMAS HIGH season, the ferries were full of locals returning from shopping expeditions to Krabi town rather than tourists. Typical for Southern Thailand, many of the men were traditionally dressed in sarongs and the women generally covered their hair with gaily colored headscarves. Elderly men huddled together on the deck with their ornamental birdcages, bringing their precious charges home from a songbird festival. The season of the monsoon rains was clearly over; the sky was a crisp, deep blue and the outlying islands were sharply etched in silhouette on the horizon. As the ferry glided alongside the pier at Saladan village, the northernmost point of Koh Lanta, a row of picturesque wooden restaurants built on stilts over the water came into view. These cater to new arrivals with menus featuring Typical Thai dishes as well as standbys like mango lassi and banana pancakes. Strolling around Saladan it soon became apparent that Koh Lanta is very popular with Scandinavian visitors. Apart from the locals, virtually everyone in the village seemed to be blond and some of the shops even had signs in Swedish and Finnish on display. Koh Lanta actually has two Swedish-language schools, set up so that the kids will not miss out on their lessons while their families spend up to six months on the island escaping the cold, dark Scandinavian winters. The well-surfaced main road runs slightly inland along the entire length of the west coast. This is where all the best beaches are found, stretching lazily one after another for nearly 30 kilometers to the southernmost tip of the island. Northern beaches like Khlong Dao, Phrae Ae, Khlong Khoang and Khlong Nin were the first to be developed and are all well serviced with bungalows and a handful of new resorts. But 1 was heading to the deep south of the island, where thickly forested hills and cliffs plunge dramatically into the sea. The southern bays of Kantiang, Nui, Khlong Jaak and Mai Phai are all fringed with perfect crescent beaches of fine sand that are some of the best in Thailand. On the slopes above Kantiang bay, the Pimalai Resort and Spa commands a spectacular seascape over the Andaman Sea. The first upscale resort to be built on the island, Pimalai is still the premier boutique property on Koh Lanta. Its standing was enhanced last year with the opening of 39 luxurious and beautifully designed pool villas that nestle in the wooded slopes above the bay. Franck de Lestapis, the convivial general manager is, not surprisingly, a big fan of Koh Lanta. A native of Bordeaux, he has called this island home for six years already and is not thinking of going anywhere else soon. "This is like Phuket and Samui 20 years ago," he enthused, "perfect beauty without the crowds." It was heartening to see that the architects at Pimalai had made a conscious effort to blend the resort in with the vegetation and preserve the natural surroundings as much as possible. A magnificent, centuries-old banyan tree, for example, instead of being felled was made a centerpiece of the design and now spreads its branches over a stunning infinity pool and terrace restaurant. As a long-time resident, Franck was obviously the person to ask about what there was to do on Koh Lanta, and during a fine seafood barbecue I put the question to him. Visit Lanta old town and the lighthouse at Koh Lanta National Park, he replied without hesitation. "Later, I will tell you about Lanta by night," he added with a Gallic wink. Taking his advice, early the next morning I drove on south towards Mu Koh Lanta National Park. The tarred road ended a short distance out of Kantiang bay, and without a four-wheel drive vehicle I wouldn't have made it much further. The road was little better than a jungle track skirting the edge of the cliff with thick jungle on both sides. The forest air smelled fresh and sweet and through the thick foliage I caught tempting glimpses of the coastline 100 metres below. I passed the deserted beaches fringing Nui, Khlong Jaak and Mai Phai bays and finally abandoned the car by the side of the track and walked the last few hundred metres to the park entrance. Only 137 square kilometres in size including 15 offshore islands, it is one of the smaller national parks in Thailand, but no less beautiful for that. The views along the coast and of the surrounding islands from the lighthouse on Cape Ta Noad are quite spectacular and well worth the trials of the road to get there. There is also an exhilarating jungle walk starting near the park headquarters lined with some of the biggest tropical hardwood trees I have seen anywhere in Asia. Heading north once again to Khlong Nin, where the road branches towards the east coast, I came across a local market in full swing. Koh Lanta's equivalent of a shopping mall, the 20 or so stalls were selling an eclectic mix of clothes, shoes, fruit, vegetables, meat and fish as well as tools, household necessities and tasty Southern Thai dishes and desserts. In the area are a number of interesting limestone caves worth exploring but it's advised to use the services of experienced locals as guides to avoid getting lost in the subterranean and labyrinthine passages. Lanta old town used to be the biggest settlement on the island and although it is still the administrative centre it has now been superseded in size and commercial importance by Saladan where the car ferry docks. Perhaps this is just as well because Lanta town is now a time capsule, with its old teakwood shophouses lining the main street and fishermen's shacks on stilts over the water. IN MARCH EACH YEAR, THE LANTA FESTIVAL HELD HERE IS dedicated to bringing back the old times with musical and dance performances and of course lots of traditional food and snacks. The festival is also a chance to see rare Sea Gypsy dances and music performed by these gentle folk whose village is situated a bit further down the west coast. For a different experience from the beach, it is now possible to spend a few nights in Lanta town at the Mango House home stay made up of restored wooden shop houses overlooking the island studded bay. Joining Franck later that evening at the Aqua bar on the beach of Kan Tiang bay, we savored something of Koh Lanta by night. With just a handful of other revelers the atmosphere was chilled and relaxed as we sipped our cocktails and watched two very fit young Thais put on a fire-twirling show. I got talking to Saffron, an Englishwoman who runs the Scuba Fish dive shop next door and asked her what made Koh Lanta special for divers. She told me that due to its location, Koh Lanta is much closer to some of the top dive sites in Southern Thailand like Hin Daeng and Hin Muang than Phuket. "We have some great diving around here, and the best thing is that there are rarely more than a couple of other boats around," she confided. According to Saffron, the nearby island of Koh Ha has 20 to 30 meters visibility year round offering cave diving, pinnacles and walls loaded with soft corals and all sorts of interesting smaller marine life like seahorses and frogfish. The lagoon on Koh Ha also has some of the best snorkeling in Thailand in water only three to five meters deep. My days on Koh Lanta passed all too quickly. Here, months could slip effortlessly by one tranquil, lazy day after another without noticing. I wish I could tell you not to go to Koh Lanta, so I could keep this lovely isle all for myself, but that wouldn't be fair. Koh Lanta is a place everyone should have the chance to enjoy at least once in their lives. Ørjan Thune webmaster Bygger ferieparadis i Thailand Tradisjonell hytte på fjellet eller ved sjøen er ikke noe alternativ for seks driftige drammensere. Nå har kameratgjengen startet byggingen av et eget ferieparadis i Thailand. Elena Solberg Mens noen kjøper seg en tradisjonell hytte på fjellet eller ved sjøen, velger andre å ha et feirehus på et mer eksotisk sted. En gjeng på seks drammensere har kjøpt seg en stor tomt i Kan Tiang Bay i Thailand, der de er godt i gang med å bygge hvert sitt feriehus. - Jeg har alltid likt Thailand veldig godt. Det er "Smilets land" - man blir alltid møtt av hyggelige og hjelpsomme mennesker. Maten er god. Og høysesongen er lang. Seks måneder med bare fint vær har noe å si for valget vårt, sier Ørjan Thune, mannen som satte hele prosjektet i gang. Thune har alltid drømt om å ha et feriehus i Thailand. Engasjementet var smittsomt, og flere av kameratene hans ble med på å realisere drømmen. - Prisene øker raskt. Jeg tenkte at skal jeg kjøpe et hus i Thailand, så må det skje nå. Men så fikk jeg flere av mine kamerater til å være med, og da ble det bestemt å kjøpe en stor tomt og bygge sammen. Ørjan Thune er en av de seks drammensere som bestemte å bygge et feriested i Kan Tiang Bay. Kjøp dette bildet Resort Verken Ørjan Thune eller kameratene hans har planer om å være i Thailand mer enn en eller to ganger i året. Resten av tiden skal feriestedet leies ut. - Hele stedet bygges som resort og alle husene er planlagt som utleieobjekter. Vi skal feriere der et par ganger i året, men resten av tiden skal husene leies ut, sier Thune. - Tanken er å bygge et spesielt sted. Det skal ikke være for luksuriøst, men greit og funksjonelt. Vi satser på mye plass mellom hyttene, slik at vi får et stort hageanlegg. Det er ikke så mange muligheter igjen til å få en bit av et paradis. Vi vil bygge slik at man får mulighet til å nyte den vakre naturen som er i Kan Tiang Bay, forteller Thune. Ingen Spania-hus Feriestedet skal stå ferdig i november neste år. Og Thune har troen på prosjektet sitt. - Spania-hus har aldri vært aktuelt for meg. Et feriested i Thailand derimot er noe jeg kan trives med. Det er min form for Spania-hus. Men det kan jo ikke stå ubrukt. Dermed skal det drives som privat hotell. Hovedmålet er ikke å tjene penger, men å ha et spesielt sted å feriere.